After graduating, some of my friends decided to work overseas (where they studied), while the rest of us returned to KL to work. However, this friend of mine, Chor, chose to work in Ipoh. According to him, the rent is cheap and the food is abundant. 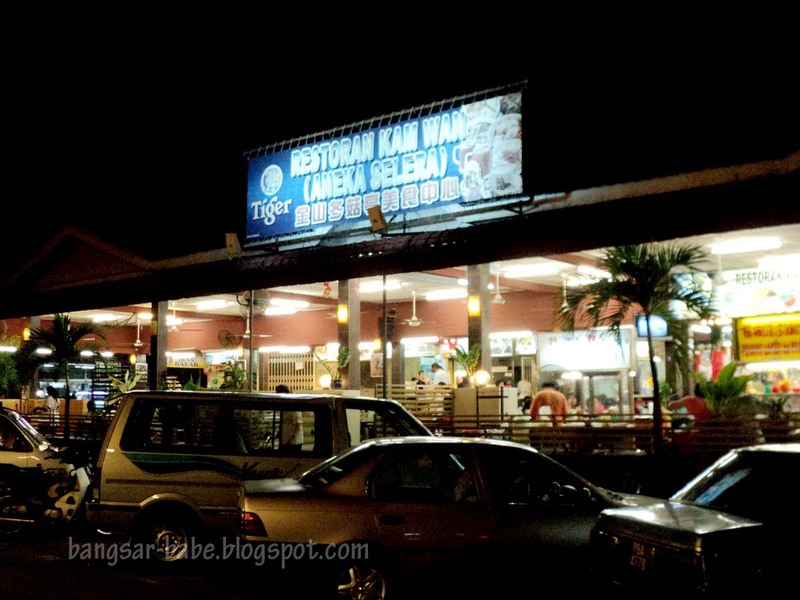 Since he’s been working in Ipoh for more than half a year, I asked him to choose a place for dinner. “Errr…I don’t know wor. I normally eat McDonald’s or noodle soup from the nearby coffeeshop,” he replied. Unlike me, Chor isn’t fussy when it comes to food — he eats to live, not live to eat. He didn’t even know about the curry mee at Nam Chau, or the sar hor fun at Thean Chun, or the Ipoh White Coffee at Nam Heong. But he did try to bring me to a new place – called Restoran Kam Wan (next to Woolley Food City) in Ipoh Garden. 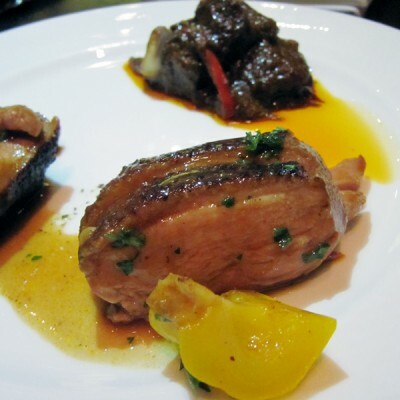 It is actually a glutton square with plenty of food choices. On a Saturday night, the place was packed. rif secured a table while Chor and I went and ordered the food. I ordered the spicy bamboo clams (RM15) and oh chien (RM15) from Meng Wa Seafood and some Penang lobak (RM7 for my plate) from another stall nearby. 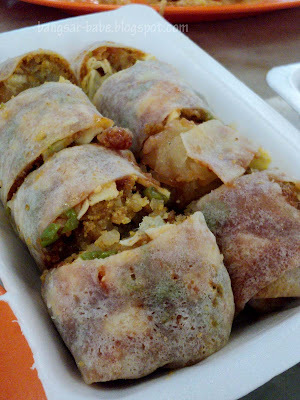 Chor ordered popiah, some pot stickers (pan fried dumplings) and three bowls of ais kacang (RM2.50 each). The seafood wasn’t that great. 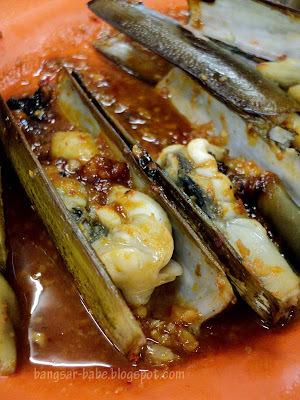 While the bamboo clams were fairly large and meaty, the spicy sauce lacked oomph. And I already requested for “extra spicy”. 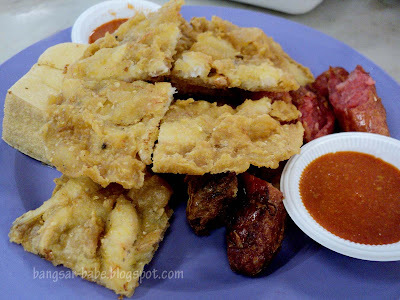 Come to think of it, most of the Ipoh dishes I know of are not spicy. The oh chien fared better. It had crisp edges, lightly cooked oysters and a fluffy centre, but I found it really oily. 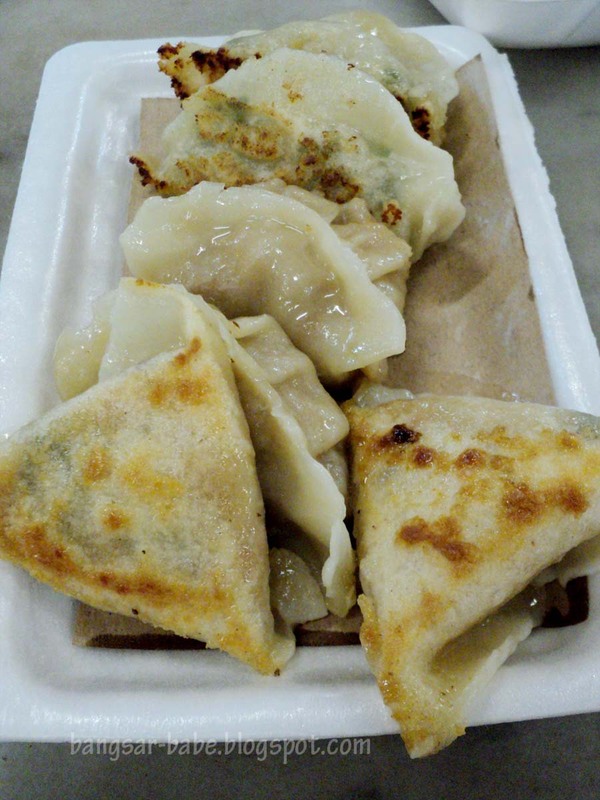 Pot stickers came in three different flavours – vegetable, pork and mushroom. I found them rather ordinary, but if I had to choose a flavour, it would be pork. The popiah comprised sengkung (turnip), julienned cucumber, shredded egg, deep fried onions and garlic. 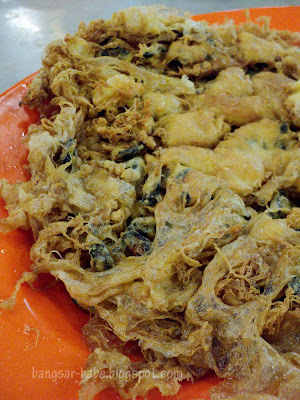 This was not bad, but I reckon the one at Kong Heng was tastier — the sauce was more piquant. 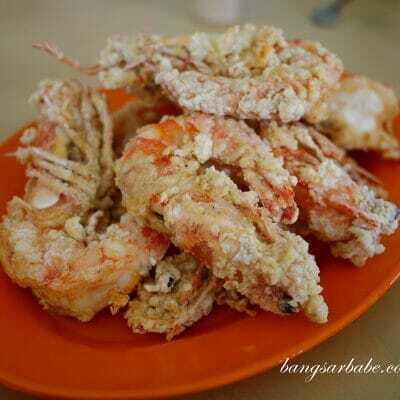 Penang lobak was nothing to shout about, but it provided a good munch while catching up on each other’s lives. 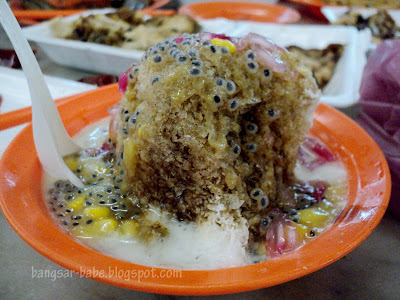 I wasn’t too impressed with the ais kacang, which I thought was a pale version of the ais kacang from Woolley Food City. While dinner wasn’t great (it wasn’t bad either), I have to hand it to Chor, for trying his best to make me happy. 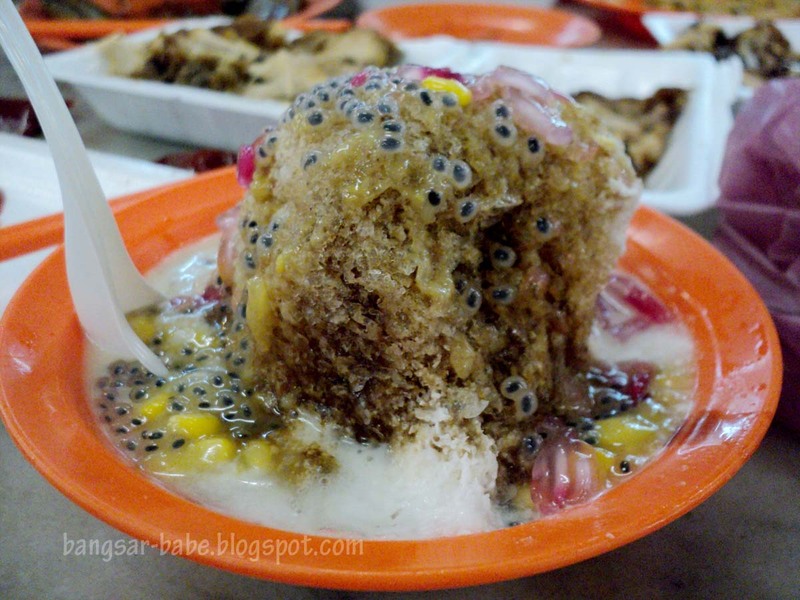 After dinner, we went to the Tong Sui Kai opposite SRJK (C) Sam Tet (post coming up soon!) for dessert. Verdict: The food did wow me, but the selection did. 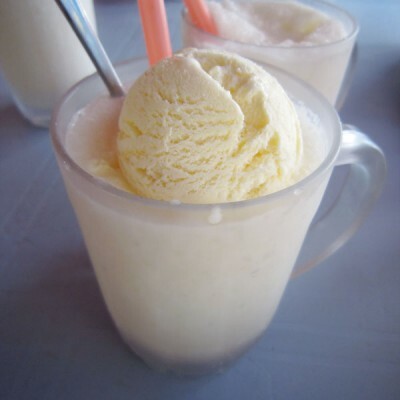 And I agree with you, the Woolley ice kacang is one of the better ones in Ipoh. the bamboo clamps so huge and meaty…sure juicy one when swallow….like the popiah a lot..